US #1 across all brands. Emerging world taking the stage. The United States is the #1 market of interest origin to each of our selected brands. Canada, UK and Germany are also all up in the rankings. However, there is notable presence of emerging markets in the top 10 origin market for each brand. Brazil, Argentina, Mexico and Turkey all claim their spot among those key locations for top car brands. 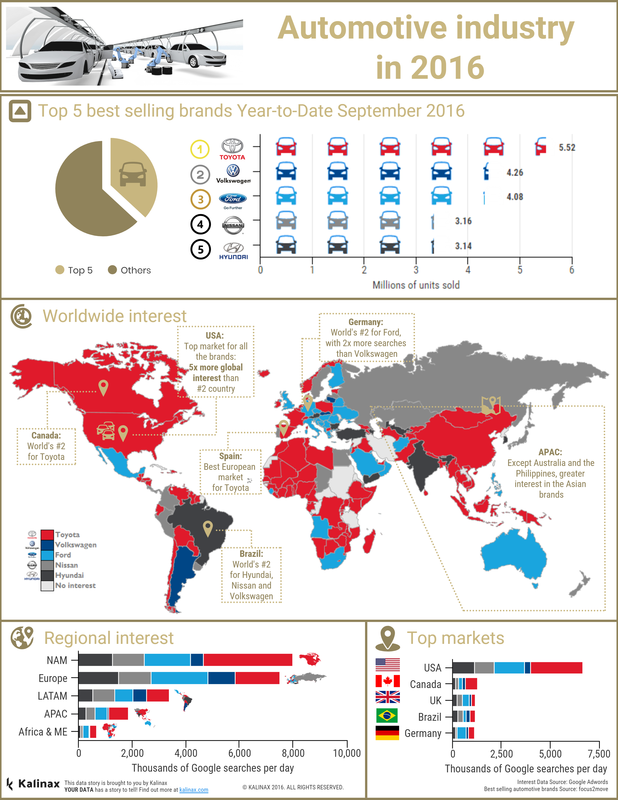 Car brands adopt different marketing strategies and positioning across the world. In consequence, every region and every national market unveils a different picture. ​​On a closer look at the top 10 countries originating interest in the five brands studied by us, we find Toyota & Ford on top of the developed markets and Mexico. Hyundai ranks first in developing Brazil and Turkey. 26.7% of the European search directed to our selected brands goes to Ford. Toyota comes close, just 0.3% behind. Kalinax Insights: Europe is the only region where Toyota does not come on top of this chart. Ford gets just about 2980 searches more in the Old World. Scandinavian countries rank high in the per capita interest charts for our selected brands. Finland comes 2nd globally, Iceland 5th, Sweden is 9th and Denmark 12th. Trends vary from country to country and while Iceland is more intrigued by Nissan, Finland wants to know more about Ford. 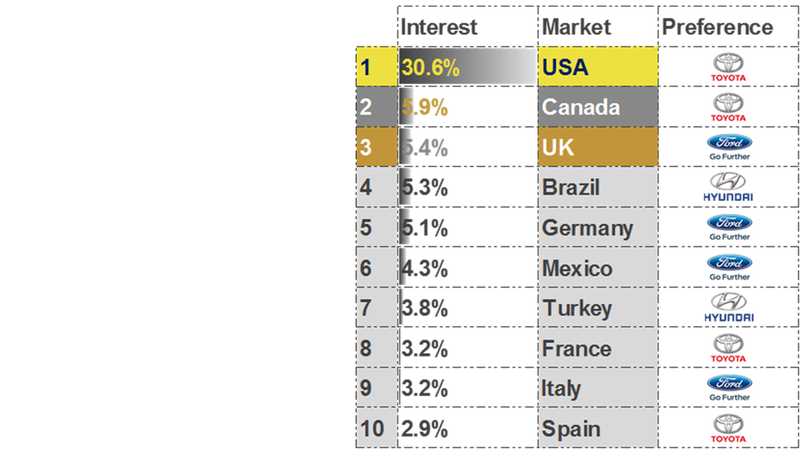 The UK is the third greatest origin of interest market in the world in absolute volume of search. The British have a taste for Hyundai which enjoys an average of 386 daily searches per day. UK is Hyundai's 3rd origin of interest market in the world, per capita. Spain comes 10th globally for absolute volumes of search for our 5 brands. If they were to choose one of our 5 brands, the Spanish would go for Toyota with 30774 Spanish residents searching this brand daily. Latvia, Canada and Slovakia also make Nissan's top 10 per capita interest markets. is not all about football and volcanos. They also have a crush on cars, especially if these are branded Nissan. MORE details, an EMERGING MARKETS analysis and TOYOTA, FORD, VW, Hyundai world heat maps below. How do the five brands we study succeed in key emerging markets? Turkey is the 7th largest market for the five selected brands in terms of absolute volumes of search. The Turkish have a preference for Hyundai with 26 337 residents searching the brand on an average day. Turkey also makes the global top 10 for Toyota, Volkswagen and Ford. Nissan has failed to build a strong brand there. Poland - this rising Eastern European market ranks 13th globally for absolute volume of search for the five brands in focus. Toyota claims the top spot in Poland, followed by Ford. Poland also makes Hyundai's global top 10. Similarly to the trends in Turkey, Nissan does not enjoy huge popularity in Poland. India comes 15th globally for the five selected brands search overall. Hyundai has adopted the most successful strategy in this market and has outperformed the other four brands in terms of brand value, with only Toyota being anywhere close. Not seeing LATIN AMERICA? That's because we have an analysis for Mexico, Brazil and Argentina further down. Stay tuned! Austria, Belgium, Czech Republic & Switzerland all made Hyundai's Top 10 (per capita) locations. Germany & Poland are among Hyundai's most successful markets too. Kalinax Insights: LATAM is the only region where Nissan is close to coming first, standing just 1379 searches behind Toyota (on an average day). Brazil is the 4th largest market globally for the five selected brands in terms of absolute volumes of search. The Brazilian have a slight preference for Hyundai over Toyota and Nissan. Brazil is among the Top 10 locations for each of the brands we studied. In other words, they just love cars in Brazil. Two positions down the global rankings from Brazil in 6th is Mexico. It is Ford what most Mexicans search for. To be more concrete, 27 046 of them search this brand daily. Nissan comes second in front of Toyota. Just like Brazil, Mexico is in the top 10 locations for each of the five brands in focus. 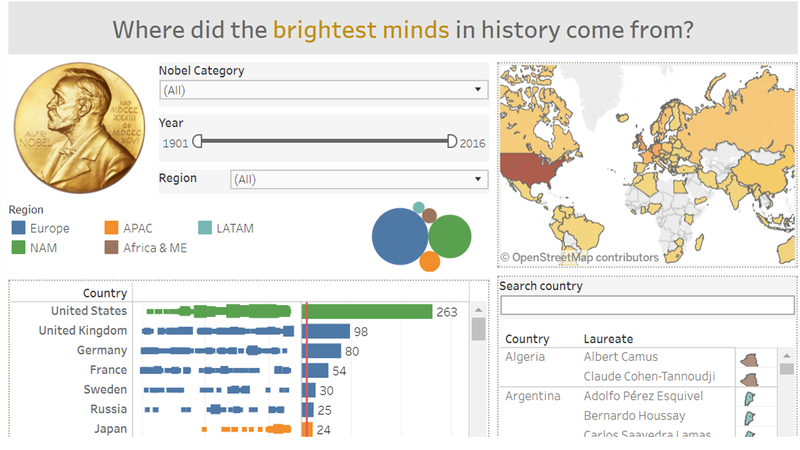 Just outside top 10, Argentina ranks 12th globally for absolute volume of search. There is a clear winner in Argentina, and it is Volkswagen. 16 445 Argentines search this brand daily. Ford comes second best, while the Japanese brands do not trend. They search "Ford" 45,329 times on an average day in Germany. Finland, Slovenia and Hungary also made the top 5, as evident from the map above. Do Asian brands do better in their home region? Australia is the 11th largest market globally for the five selected brands in terms of absolute volumes of search. As already mentioned, the Australians have a strong preference for Ford. Toyota comes second, leaving the remaining three brands far behind. Even so, Australia still features as one of Nissan's top 10 locations globally. Five positions down the global rankings from Australia, in 16th is Singapore. Toyota attracts more interest in Singapore than the other brands we studied. Notably, Singapore boast the second highest concentration of Toyota fans globally, our per capita report suggests. The other four brand are rather unsuccessful here. Vietnam - only 17th globally, but still one of the key top 5 Asian locations. Vietnam shows a clear preference for Toyota but it ranks high in search for all the brands we studied. 13.2% of the Latin-symbol search for "Toyota" in Asia Pacific can be tracked to this rather small country. *Our research is limited only to the English language search, thus it does not paint the full picture for countries where non-Latin symbols may be used to search brand names. The only countries where a highest proportion of the population searches "Volkswagen" than in Argentina. We need to say that it is a bit strange the #1 selling brand does not top our search volume chart. But then, when you think how naturally the Volkswagen correct spelling comes, it all starts to make sense. *Our experts have included in their analysis various misspelled versions of the brand name, but this list is not exhaustive. Second only to US, Canada is exploding of interest in cars. It is no wonder it comes first when we look at the per capita figures. And it is Toyota what Canada needs to know more about. On average, the Japanese vehicles feature in the search of 63 689 Canadians daily. Canada doesn't stop there and features in the top 6 for all other brands studied. The greatest volume of search for the five brands we studied comes from the United States. In numbers - 270 585 Americans type "Toyota" on an average day. This is 78% more than the second best in this ranking - Ford. Nissan and Hyundai are tie for the 3rd while Volkswagen remains last in the US. SA ranks only 14th globally in terms of search volume for the five brands, however tops its vibrant region. Ford comes first in South Africa, leaving Toyota in second. The other three brands attract rather unimpressive volumes of interest in Africa's key market. From Canada to Norway, and from Finland to Estonia, Toyota trends well up in the north. Want to explore more of our stats and heatmaps on Cars?